It is my fortnight in UK and I am yet to see any uniformed man on roads: traffic police, police or army man. Not only this I happen to go to shore and a dockyard and there again was no security. Though my hands were trembling. But no one stopped me clicking photographs. God knows how they are going to treat my laying bare of their country's coast. To ensure doubly I asked an Englishman if photography was not prohibited. He said I could freely click. I said it was a dock. The man then explained that Britains was not that fragile. 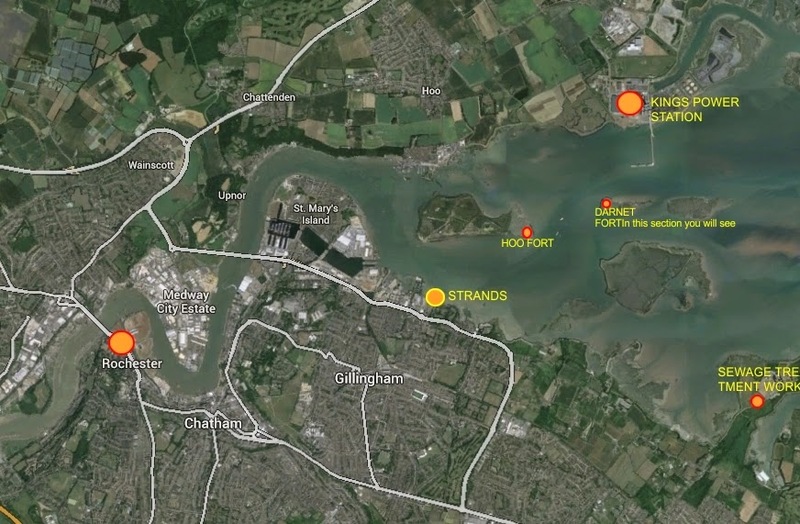 Below is the satellite map of Gillingham, Rochester, Rainham and Hoo areas. 2. Rochester - Castle and Cathedral area. Sorry I couldn't go inside and will visit this ancient 11 century fort and 7th century cathedral. This section is dominated by my clicks which I took while moving. But you should remember that most of the buildings at Rochester area are all old ones. Some of these are medieval ones and find their mention in classic literary works. Charles Dicken's house was also among them. But I am yet to identify it.